It looks like Americans didn’t buy that “You didn’t build that!” BS Obama was spewing on the Campaign trail, huh? Mitt Romney now has a clear lead on Barack Obama, 48-44. That number is outside the margin of error. 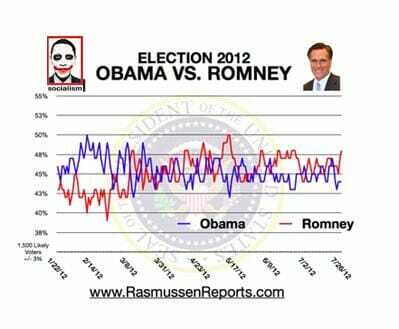 The Rasmussen Reports daily Presidential Tracking Poll for Thursday shows Mitt Romney attracting 48% of the vote, while President Obama earns support from 44% . Four percent (4% ) prefer some other candidate, and five percent (5% ) are undecided. Today, consumer confidence has fallen to the lowest level of 2012. Most Americans believe both the economy and their own personal finances are getting worse. Long-term optimism about the economy has fallen to the lowest level ever measured by Rasmussen Reports. Just 40% expect the economy to be stronger in five years. That’s down from 46% a year ago, 50% two years ago and 58% three years ago. Most believe the housing market will take more than three years to recover.